This scenic place was formerly a first-line frontier defense city. This is the very first installment to embark on an Instagram journey through the vastness of Russia — why don’t you join us? An ancient fortress with walls several meters thick, ostriches roaming the wooded flatlands and a pagan sacred site: see all this and more! This time we are visiting Izborsk (or Old Izborsk, as the locals call it), 455 miles north-west of Moscow, just near the Russian-Estonian border: it was once a bustling city on the very first line of the North-West frontier defense repeatedly besieged by the Livonian Order and other daring invaders, never succeeding in direct combat. Now it is a village, not a city, and you can hardly imagine a more peaceful or picturesque place. 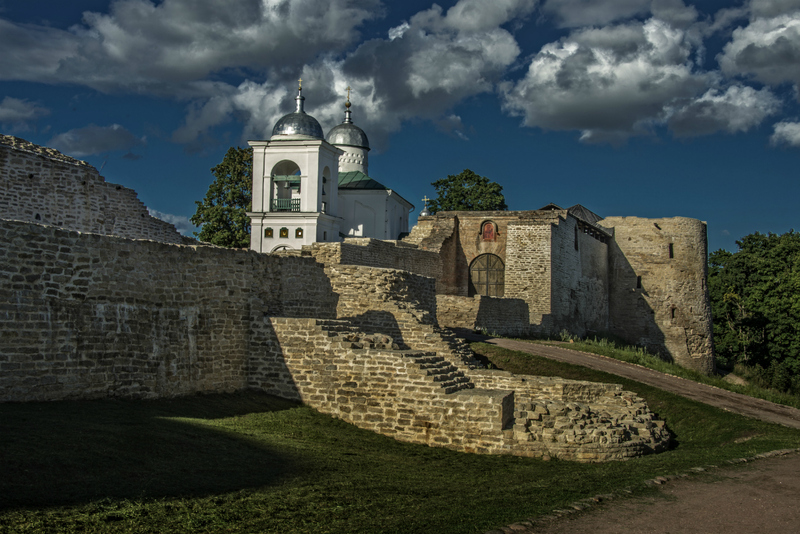 The heart of the ancient city was Izborsk Fortress, now the village’s main tourist attraction. This strong fortification dates from the 14th century, built near the site of an earlier one. Even now, the six still-standing towers are evidence of the fortress’s defensive power. This is how the village looked just a century ago. Now the carefully restored houses mark the beginning of the tourist area of Izborsk. Look at the pavement: it’s the real ancient one, also restored. This exquisite natural beauty is called Slovenskiye Springs, more than a thousand years old. Just think, the clear water sprays are more ancient than the time-worn stone walls! Since ancient times, the springs have had sacral significance, being first a pagan site and then bearing the second name of The Springs of the Twelve Apostles. The Slovenskiye Springs make their way to Lake Gorodishchenskoye, a habitat for ducks and graceful swans. An ancient legend has it that these swans have never left the lake, and as long as they remain there Izborsk will never fall. Since both the swans and the village (and even the fortress) are present, the legend is definitely true! This tiny chapel was founded not far from Izborsk in the name of the Derzhavnaya Icon of the Mother of God. Although it seems as ancient as any Izborsk church, it dates from 2012. The Poklonnyi (Worshipful Submission) Cross nearby commemorates all the victories of the Russian military and all the fallen Russian warriors; its basement (called The Holy Hill of the Unity and Glory of Russia) consists of earth from all the places of Russian military glory. ...And when military victories are won and the battles stop thundering, this is what the Izborsk vicinity looks like. Perfect beauty and tranquility. Time seems to stop flowing here, and calm pervades the soul. But did you ever imagine that this land is home to… ostriches? That’s right. Not only can you give them a stroke, but also try fried ostrich eggs! Well, probably one egg — because of its size. The cheapest way to spend your time in Izborsk: bring a tent! But mind the weather: the North-West region of Russia isn’t renowned for its mild climate. Although Izborsk and its surroundings are among the most peaceful places in the world, there’s still room for the adrenalin rush! The scenic nature contributes to that even more. This is how a typical ancient Izborian domestic goddess used to spend her time in days gone by: at the stove. Of course, it happened only when all the house duties were done and dusted, so to speak, i.e. pretty much never. Don’t be alarmed, these guys are our contemporaries. But what could be a better place to bring the past back to life than an ancient fortress? Btw, Izborsk hosts a few re-enactment festivals every year: a great chance to imagine ancient life, warts and all. Need a lift? :) Frankly speaking, you won’t need one here in Izborsk: ancient cities, even the most powerful ones, are not really large by modern standards. Everything is easily reached on foot. This is definitely the cutest and probably the most surprising side of Izborsk: it’s a cat-loving city! Cats can be seen everywhere (this one is nestled right in the fortress), plus they’re nice-looking and well-fed. And they have no fear of human beings, so please don’t exploit that. An ancient custom for an ancient city: these lanterns were in use decades ago, but seem to fit these houses perfectly. ...The forward march of progress. Like it or not the technological revolution is seemingly unstoppable. One more part of the legacy of the past: this cross is named after Truvor, a legendary Varangian (Viking), brother to Rurik, who made Truvor prince of Izborsk. True or not, Truvor is a popular character of many legends and tales told to tourists here, although this particular cross might have nothing to do with Truvor: it dates from the 14th-15th century, while the legendary prince died in 864, according to the annals. Nothing extraordinary, just clay pots decorating a palisade. Well, ok, it might be a good way to dry them, but they have ornamental value, too! Look: the fortress walls are THAT thick! It’s easy to imagine what life was like here in times of war and peace. But why don’t you reply to the invitation and see for yourself?